About time the Left were honest with us about what they really think. Screw the Constitution and the horses it rode in on. Let the good times roll! They were "reformers" who wished to "reform" the "catholic" (universal) church into something layered with sophisticated doctrine, just correct Rome's errors. So to a primitive Christian, what we think of as "The Bible" would have been compiled by a corrupted church. We should thus see how this could inspire the Christian-Deists and Unitarians to continue to "edit" the canon, with Thomas Jefferson as the most notorious example. Sam Haselby, historian and author of the book, The Origins of American Religious Nationalism, gave an interview with dailyhistory.org. "I have argued that James Madison and Thomas Jefferson were visionary secularists and that they launched what was a historic, if ultimately faltering, and kind of feeble secularization project. That is true. Other notable Americans of the revolutionary era were acutely Protestant. Patrick Henry and John Jay, for example. 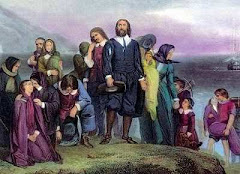 They were deeply religious and wanted the US to be so too. So was Timothy Dwight. So were many, many others of the revolutionary generation. Most people probably wanted the US to be a devout country. But there was no agreement on what that meant. The range of positions was broad, very broad. 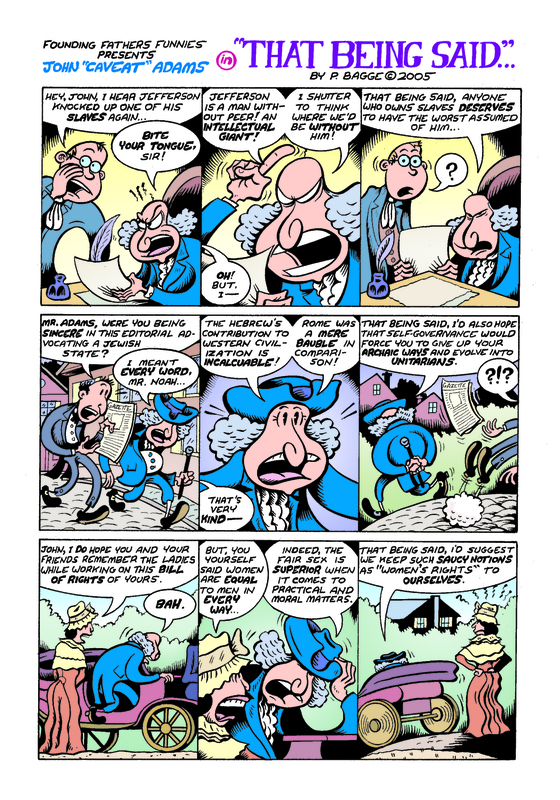 For those who prefer their revolutionary icons served with a saucy side of sarcasm, Peter Bagge's Founding Fathers Funnies. 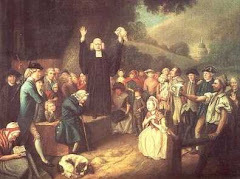 Benjamin Rush Delivers a Discourse "On Oaths"
If oaths [as already explained] are contrary to reason, and have a pernicious influence upon morals and the order of society; and above all, if they are contrary to the precepts and spirit of the gospel; it becomes legislators and ministers of the gospel to consider how far they are responsible for all the falsehood, profane swearing and perjury that exist in society. It is in the power of legislators to abolish oaths, by expunging them from our laws; and it is in the power of ministers of the gospel, by their influence and example, to render truth so simple and obligatory, that human governments shall be ashamed to ask any other mode of declaring it, from Christians, than by a bare affirmation. The friends of virtue and freedom have beheld, with great pleasure, a new constitution established in the United States, whose objects are peace, union and justice. It will be in the power of the first congress that shall act under this constitution, to set the world an example of enlightened policy, by framing laws that shall command obedience without the absurd and improper obligation of oaths. By this means they will add the restoration and establishment of TRUTH, to the great and valuable objects of the constitution that have been mentioned. The full text can be seen here.